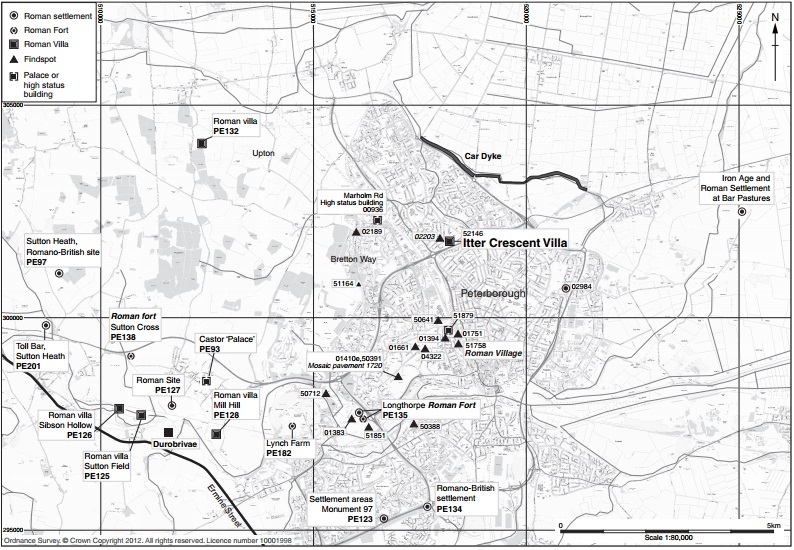 In 2011 a property development company commissioned an archaeological survey in preparation for construction of a new housing estate on an allotment site in Peterborough. The work was undertaken by Oxford Archaeology East. Quite unexpectedly it soon became clear that there had been significant construction on this site 2,000 years before! Excavations took place between August 2011 and February 2012 on a hitherto unknown Roman villa at Itter Crescent, Walton, Peterborough. They revealed part of an Iron Age enclosure ditch, several roundhouses and part of a Roman villa. The villa was two floors high with rooms surrounding a cobbled surface. Excavations also discovered underfloor heating, a kiln for making the roof tiles and various farm outbuildings. 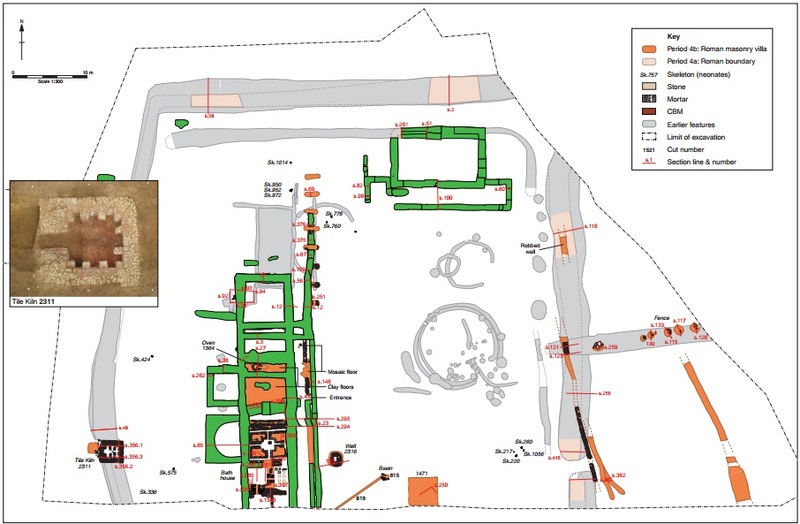 This report is made available by Oxford Archaeology under a Creative Commons license. The excavation revealed multi-period archaeological remains dating from the Neolithic through to the post-medieval period. The earliest finds were Neolithic struck flint including a retouched blade. The earliest cut feature was an Early Iron Age crouched burial of a young woman. Overlying these features were the remains of a substantial Iron Age settlement, constituting (at least) three roundhouses and a hayrick, together with an extensive layer of settlement debris. The settlement lay within a square enclosure formed by a bank and ditch. Occupation of the enclosure continued into the Romano-British period with the construction of a remarkably well preserved and extremely high status set of timber-framed buildings which were later replaced by a two-storey stone courtyard villa and bath house complex. The exceptional level of preservation within both the timber and masonry villas revealed mosaic floors, painted plaster walls, deeply stratified sequences of clay floors, a domed keyhole-shaped oven and hypocaust foundations of the tepidarium and caldarium in the bath house. Beyond the villa, evidence for the life of the inhabitants survived in the courtyard in the form of ovens, a well, drains and water tanks and occupation debris. Behind the villa a tile kiln used to fire the roof and floor tiles of the building was dug into the back-filled enclosure ditch. Sixteen neonate burials contemporary with the life of the villa were found. There was no major use of the land within the enclosure following the abandonment of the villa in the later Roman period (probably mid 4th century). Over time, stone from the walls and foundations was systematically robbed and used elsewhere. Unusually the footprint of the site became a cemetery, with eleven adults and one juvenile buried within or close to the remains of the villa itself. In the Early Saxon period an isolated burial of an adult female, buried with high status grave goods, including gold gilt shoulder brooches and a necklace of Baltic amber and glass beads, was found. The site was ploughed during the post-medieval era and became allotments in the 20th century. Neither of these activities proved destructive to the underlying archaeology. Extending along the Nene Valley, approximately 7km to the south-west of Itter Crescent, are the best known Roman archaeological remains of the area. These were serviced by a network of Roman roads, including Ermine Street and the Fen Causeway, with river crossings identified at Durobrivae, Gunwade Ferry,Longthorpe and Botolph Bridge. The Roman town of Durobrivae (SAM 130) lay to the south of the River Nene on the line of Ermine Street. 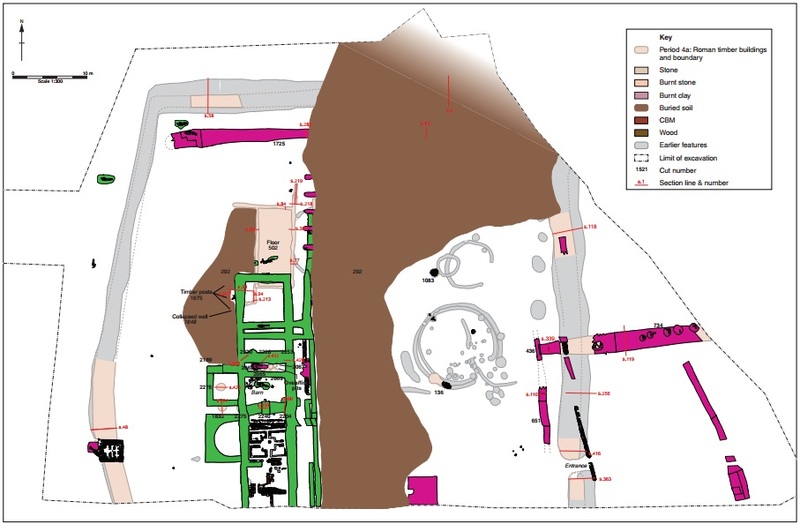 Extensive Roman remains found nearby at Castor include the ‘palace’ or praetorium (SAM PE93). The military forts at Longthorpe (SAM PE135), Water Newton (SAM 130) and Sutton Cross (SAM PE138) all lay relatively close to the subject site. Strung out along River Nene and Ermine Street to the south-west of Itter Crescent were various villas, including those at Mill Hill, Castor (SAM PE128), SibsonHollow (SAM PE126) and Sutton Field (SAM PE125). Limited investigation has also been conducted on another villa to the north of Oxey Wood, Upton (SAM PE132). Within Peterborough itself, the remains of possible high status buildings (including destruction debris and a mosaic floor) have been found relatively close to the site. Before the evaluation took place, Peterborough City HER contained no records relating to archaeological sites or finds from the development area itself. The majority of the records in the HER relate to finds of artefacts made prior to the extensive development of the area in the 1960s and 1970s. These early finds include Roman pottery and coins found approximately 100m west of the study area. Peterborough HER includes five records relating to prehistoric finds within the search area. They include a Palaeolithic hand axe (HER 2211/50129), a Neolithic worked flint arrowhead (HER 2205), a Bronze Age arrowhead (HER 2218) and a small group of early prehistoric worked flints (HER 51932). Iron Age findspots include an Iron Age coin (HER 2220) and a spearhead (HER 2206). Excavations at Wesleyan Road, Dogsthorpe (HER 51461, 51933), 800m south-east of the study site, revealed three phases of settlement spanning the Middle to Late Iron Age. Roman findspots include two Roman coins (HER 50424, 52107) to the west and northwest of the study site. A single piece of Roman tile or tessera was found approximately 400m to the north of the study site (HER 50599). A small quantity of Roman pottery was recovered from medieval features during archaeological investigations at Paston Rectory (HER 50502). A larger group of coins and Roman pottery is reported to have been found 100m west of the study site in 1912 (HER 2203). Paston is thought to have developed as a village settlement in the Late Saxon period; 11th-century carved stones (HER 2244b) are incorporated into the medieval parish church of All Saints (HER 2244). A small quantity of Late Saxon pottery was recovered during excavations at Paston Rectory (HER 50502/51299). 47 struck lithics were recovered from 43 contexts. The material is residual and dates between the Late Mesolithic/Early Neolithic (4500-3000 BC) and Late Neolithic to Early Bronze Age (3000-1500 BC). 10224 sherds of pottery were recovered from 591 individual deposits, representing more than 2,200 vessels. The majority of the pottery is locally produced shell or quartz tempered utilitarian coarse wares (jars, bowls and storage jars), although some fines wares, including samian were found in moderate quantities. Other specialist wares including a range of (imported) amphora and (regionally traded) mortaria were also found indicating that Roman tastes and cooking practices had been adopted and trade in ceramic goods, and their contents, was taking place. 11,718 fragments of CBM were recovered from 1201 stratified contexts. They mainly consist of undiagnostic flat tiles, the majority of which are likely to be tegulae. A total of 418 fragments of daub, fired clay and fired clay objects were recovered from 64 contexts. These include the partial remains of Iron Age triangular loom weights. A total of 1964 fragments of painted wall plaster were recovered. These mainly derived from three distinct areas of the villa, meaning that they can be linked to particular parts and phases of the building complex. Although fragmentary, exceptional preservation has allowed for colours and designs to remain clear and separate decorative schemes to be discerned. The stone assemblage is dominated by querns and by structural stone. Quern fragments were recorded from a total of 21 contexts. The structural stone includes pieces of columns and a likely voussoir. Several of these retain plaster on some surfaces. All the structural and architectural stone is limestone but from a variety of sources. Most is Lincolnshire Limestone (probably Weldon stone), although one of the fragments is of Portland limestone and another block is of Purbeck limestone. been cut from tiles (most likely tegula). Two areas of red tessalated flooring survived in situ. In addition, a number of small stone tesserae of a similar size (5-10mm) were also recovered – mostly of a blue-grey or white stone. 8 Anglo-Saxon glass and amber beads were identified. They all come from a single grave, estimated to date from mid-6th century AD. 54 Roman coins and a post-medieval jetton were recovered. The Roman coins cover most of the Roman period but the majority are of later 3rd and 4th century date. 35 complete skeletons were retrieved comprising 16 adults, a single juvenile and eighteen neonates. A small amount of disarticulated bone, primarily relating to the remains of eight neonates, was also found. 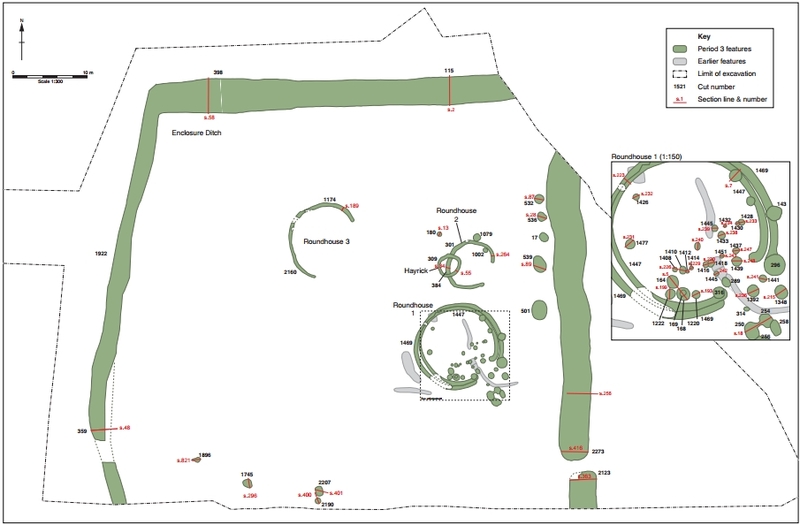 Chronologically this assemblage consists of: an Early Iron Age crouch burial; eighteen neonates found in the courtyard of the villa and believed to be contemporary with the occupation phase of the site; thirteen adults buried in the demolition layers and robber trenches of the masonry villa; an Anglo-Saxon burial found with associated grave goods. Faunal material was recovered from a variety of features including pits and ditches dating from the Late Iron Age to Early Saxon periods, with the majority being obtained from Late Iron Age and Roman features. In terms of species the finds are dominated by domestic mammals, with sheep being most prevalent in both Iron Age and Early Roman phases. Cattle are the dominant species in later Roman contexts, while pigs are present in all phases. It was considered noteworthy that the numbers of horses is proportionally quite high in relation to other domesticates (horse is the third most prevalent species in Iron Age contexts). The discovery in 2011 of the Iron Age settlement and Roman villa complex at Itter Crescent provided an excellent opportunity for further work to be undertaken by a community group on allotment land to the south of this excavation. Supported by Heritage Lottery funding the community excavation and was undertaken in 2014.